Getting there: From Panther Junction, head west on Hwy 118. Turn south onto the Ross Maxwell Scenic Road and proceed for about 13 miles, looking for a sign indicating the Chimneys Trail on the right. Park on the extended shoulder. The Hike: Mention a desert hike to most people and they conjure up images of Gary Cooper in the movie Beau Geste among the sand dunes. However, the portion of the Earth's surface referred to as desert do not all consist of oceans of sand. The Chimneys hike in Big Bend National Park provides a different view of the desert. 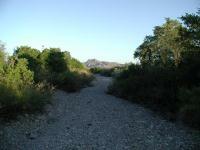 The trail consists of a well worn path through the desert. The Chimneys are low in the distance to the right of Kit Mountain. The trailhead for the Chimneys hike starts along the side of the Ross Maxwell Scenic Drive. Far off into the distance one can see the turnaround point for this hike. A row of rock outcroppings spread out across the desert floor. The Chimneys from this distance are overshadowed by Kit Mountain to the south, but the Chimneys will make their impression later. The trail here may be harder to find and keep track of than some of the trails in the Chisos Mountains, but once you know what to look for there is not much of a problem. The ground here is rocky with compacted soil. Look for a well worn line that almost resembles a shallow bowling lane gutter and you've found the trail. Even if you lose sight of the trail the start and end points are clearly visible, so getting lost should never be an issue. 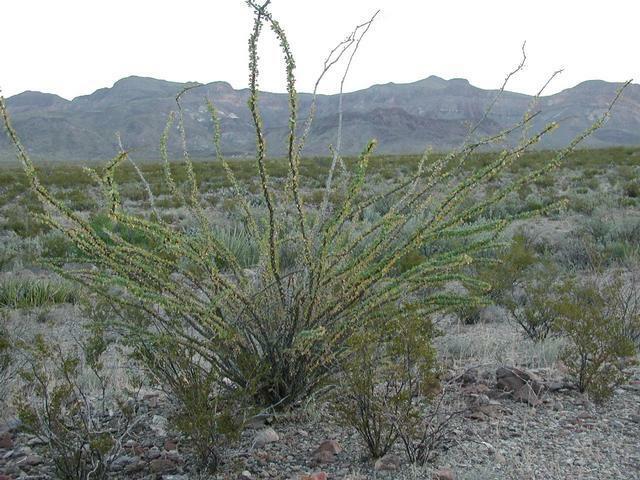 Desert plants, such as this Ocotillo, have adapted to the dry environment in unique ways. Obviously desert hiking calls for a few precautions that might not be as important on other hikes. First, the desert can become extremely hot, particularly during the summer. Consider tackling this trail during the cooler months of the year. We hiked the trail in October and the weather was perfect. Second, there is no water on the trail and even if you found some during a wet period you should not drink it. Always bring water with you on this trail and bring lots of it. Third, pick the time of your hike carefully. By starting off very early you can avoid hiking in the hottest parts of the day. We started just before Sun up. Lastly, wear Sun screen. There is no cover and thus no protection for your skin. The dry creeks that run through the area carry enough moisture to support relatively lush vegetation on a thin line in the desert. The trail progresses in what appears at times to be a straight line. Directly behind the trail, looking back towards the trailhead loom the Chisos Mountains, which harbor a world very different from this one. The vegetation here is sparse, but there is surprising variety and abundance. Prickly Pear cactus is here as you would expect, but many other natives predominate. 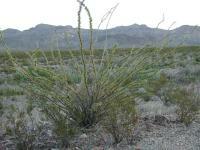 One of the largest is the Ocotillo plant. This interesting plant consists of limbs that grow leaves along its length with no dividing branches. This all trunk and leaf design has a purpose. In times of drought the Ocotillo preserves water by drawing its moisture into its tough trunk and shedding the leaves until a wetter period arrives. The Chimneys come into view. This line of rock formed under ground eons ago and was exposed when the surrounding rock eroded. The lack of moisture prevents plants from clustering too densely. Typically plants are buffered from others by bare soil, which mostly consists of rock and gravel. Looking out onto the horizon though it becomes apparent that there are ribbons of denser growth. These lines of plants and trees follow the paths of dry streams in the area. While no water was present in any of the streams when we visited the extra moisture that they provide was just enough to allow the more thirsty plant varieties to grab ahold of life in the desert. Nearby a rock overhang provided a good place for Indians to build a shelter from the elements. These remains have not been reconstructed. As you continue to head west along the trail the Chimneys will begin to rise above the horizon. The Chimneys are a volcanic dike formation that was created within a fissure of rock beneath what was then the surface of the Earth. As the softer, more erosive rock around it weathered away the Chimneys were exposed. 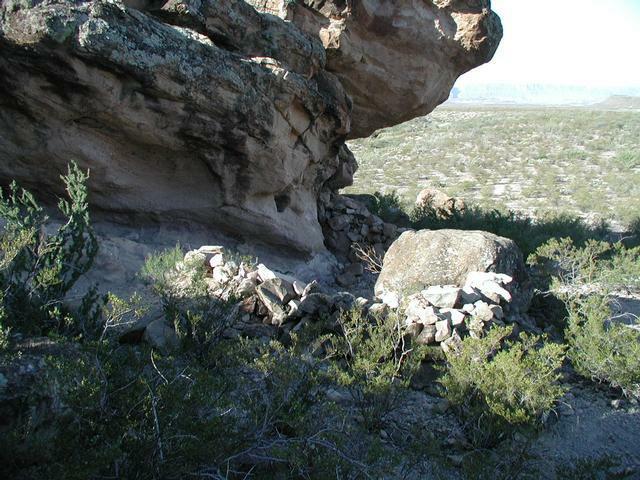 This distinctive formation served as a valuable point of reference for Indians who lived in the area for hundreds of years. Once the trail arrives at the Chimneys smaller trails fan out between and around the sections of the formation. Evidence of the importance of the Chimneys to the local Indians can be found in the pictographs that are carved on one of the flat stone surfaces of the southern-most spire. To ensure that the carvings are preserved for future generations you should not disturb nor even touch them. The southernmost Chimney stands apart from the rest. On the western side of the Chimneys sits a large rock that overhangs the remains of a small dwelling. The remains of the stone walls rise to waist height. Inside the walls lay a couple of grinding stones. According to a Park Ranger the native Indians used this area for seasonal shelter. A nearby spring provided them with the water they needed. After investigating the Chimneys and the signs of Indian life around it we headed back towards the trailhead. Optionally, the Chimneys trail continues westward for another five miles to Luna Jacal. The trip back to the trailhead is all uphill. But the slope of the land is gentle so there is no strenuous effort required. Yield to any snakes along the trail and they'll go about their business and leave you alone. 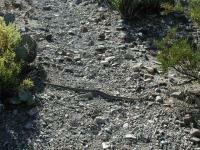 On the trip back to the trailhead we had our second encounter with a Rattle snake during our Big Bend trip. This time a snake was crossing the trail about 4 feet in front of us before we noticed him. Our first sign was the movement of the snake as he backed up from the trail to the base of a plant and eyed up suspiciously. After a few moments of standing still he sensed we were less of a danger and continued crossing the path. Like our earlier encounter, at no time did the Rattle snake rattle or make a threatening move. Rattle snake attacks in Big Bend are very rare. Provided you leave any snake you find alone you need not worry too much about encountering a snake along the trail. The solitude of the hike is grand. During our three and a half hours on the trail we saw and heard only one other group who continued on to Luna Jacal to the west for a 7 mile one way trip. 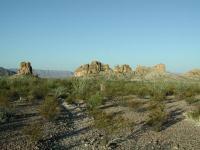 When visiting Big Bend it's important to experience the variety that the park has to offer. Should you have only a day to spare in the desert the Chimneys hike would be a very good choice indeed. 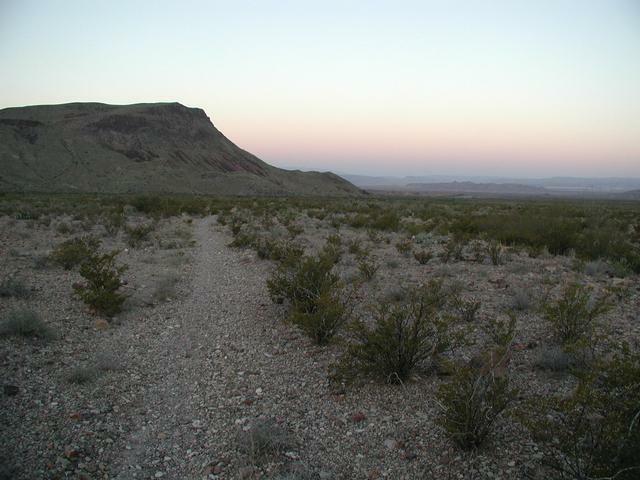 A very flat, featureless and exposed hike to the the tall and rocky ridge, visible in the distance. While the hike to The Chimneys is horribly boring, the landscape once you get there is interesting. Climbing some of the lower outcrops provides a good view over the desert landscape: to the south is Kit Mountain, and beyond that the Chisos Mountains. There's also petroglyphs at the base of the southern-most rock outctop. 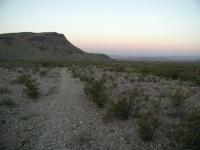 I hiked the Chimneys Trail from Ross Maxwell Scenic Drive to the end of the trail near Old Maverick Road. The trail is flat and easy to follow. Trail signs are placed at both ends and rock cairns mark the path along the way. 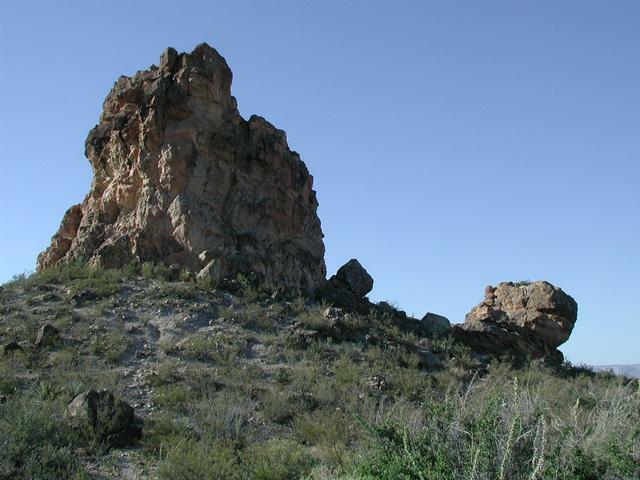 The Chimneys is a group of rock formations that are approximately 2.5 miles in from Ross Maxwell Scenic Drive. It seems this is a destination for most hikers, but you can continue hiking on (as I did). I expected the Chimneys to be nothing more than rock formations, but I was pleasantly surprised to find that one rock formation was an ancient settlement site complete with pictographs and evidence of historical habitation. It really gave me a glimpse into what life and survival must have been like in ancient times. If the the cacti are blooming the hike to Mule Ear Springs is about the same degree of difficulty but a lot prettier. And better than both is the hike to Devil's Den although it's a little tougher and requires some route finding skills. We enjoyed this one quite a bit. 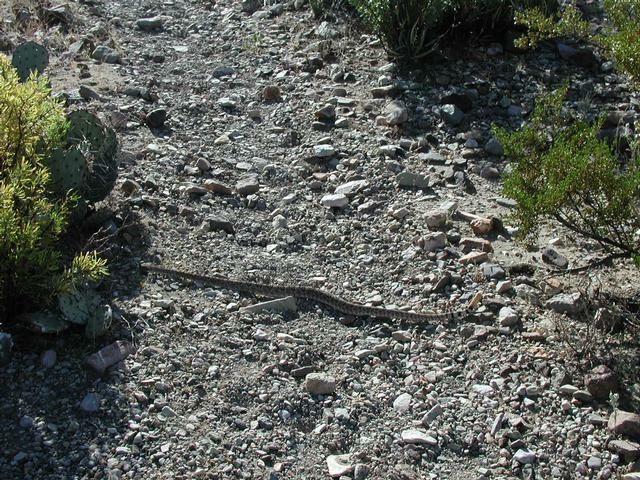 Crossed paths with a rattle snake along the way and only saw a small group of other hikers in the distance.